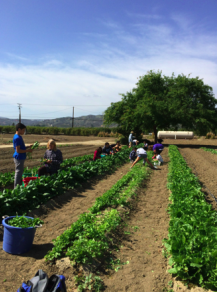 This service highlight was originally posted by the California Farm to School Network and was written by former FoodCorps Service Member, Chris Massa, with Ventura Unified School District. After serving with FoodCorps for 1.5 years, Chris Massa has now landed the position as the Farm to School Operations Specialist with the school district. Read on to learn why Chris is advocating for student-runned farms along the southern Central Coast. This is a persistent question I encounter while learning in the garden with students from Ventura Unified School District. “If we provide it with all the necessary elements, air, sun, water, and soil, it surely will,” I reply. Ventura County is steeped in agricultural history, from the bygone days of dry farming lima beans and sugar beets, to currently being in the top ten in the US for total crop value. Despite this, there still remains a disconnection for students between their food and the farm. Luckily, many people are working to change this trend. My introduction to being a garden educator started back in August of 2013 at a FoodCorps orientation. I learned so much during that week, but one statement has stuck with me ever since. Whitney Cohen, from Life Lab, plainly stated, “Learning should be fun!” And while most of us couldn’t agree more, it seems our educational system has forgotten this: with its standardized tests and extended periods of students sitting in desks. From preschoolers to high schoolers, the garden invokes a sense of mystery and amazement. Life is abundant and comes in infinite forms. A hummingbird zips by, a lizard scurries under a rock, a fragrant flowering tangerine tree is buzzing with bees. It is no wonder I often hear students saying, “I want to come to the garden every day!” I say let’s let them, weather permitting of course. I can’t think of a better venue to teach youth than in the garden or on the farm, because it truly does make learning fun. I have been fortunate enough to help create a student farm here in Ventura County. The University of California Hansen Agricultural Research and Extension Center donated a ¼ acre to Ventura Unified to teach students about agriculture and to grow food for the cafeterias. My goal over the past year and a half has been to fulfill this missionFi. This program has been successful in bringing the experiential and hands on learning mandated by Common Core standards and promoting positive youth development. In addition, it supports the burgeoning Farm to School movement. But, besides all that, it’s just simple. So, instead of Farm to School, why don’t we start creating Farm Schools? I know that this is what many of us are attempting to do with school gardens, but wherever possible, let’s think bigger . . . like tractors, chickens, goats, fruits and veggies galore. The ultimate goal of education is to create healthy communities and school farms do just this. To be sure, I don’t want to be a downer - but I think it is important that we shed light on the problems plaguing our communities and how school farms provide a salient solution to many of these issues. The prevalence of processed foods, unhealthy eating habits, and more sedentary lifestyles has created an obesity epidemic in our nation. According to the Center for Disease Control (CDC) 18% of children and adolescents aged 6-19 were obese in 2010. This is particularly troublesome since another CDC study also found that 80-90% of people diagnosed with type 2 diabetes were also obese. The best way to manage diabetes is to eat healthy, namely fresh fruits and vegetables, and to exercise, exactly what we do at the student farm. Further, the United States has more people in jail than any other nation. Students with low educational aspirations tend to be at risk for juvenile delinquency. This starts a vicious cycle of incarceration. Can we nip this tragedy in the bud, pun intended, by inspiring students in the garden or farm? Additionally, the farm could employ high school students after school. I see school farms as an actual solution to our social issues as opposed to just continuously treating the symptoms. My plea is this: let’s create schools whose PRIMARY focus is the production of organic fruits and vegetables. People are becoming aware that it is possible to teach science, technology, engineering, math, history, language arts, and basically any subject matter you can think of in the garden. The Edible Schoolyard in Berkley, CA is a living example of what I am attempting to describe. So what is hindering other schools across the country from doing the same? Is it culture? I think not. In 1943, there was approximately 20 million Victory Gardens producing 8 million tons of food; which was around 41% of all vegetables consumed in the US! (City Bountiful: A Century of Community Gardening in America, Laura Lawson) Maybe it is more of a financial issue? This could be, but the real question is; what is more costly, letting students produce healthy organic food for themselves or the health and social costs associated with obesity?